We’ve got a fun one for you to try! The stand up exit! Rene Terstegen shows us how to do it here at Skydive Spain. When the group that you are following already have left the plane the trick is to get as much as possible downward speed and downward speed is into the wind so you end up later on level. For a nice steady exit it is very important to leave straight out of the plane. A good trick for this is to leave with the hips first so the legs and the upper body come out straight at the same time. If you are having a hard time bringing your feet down into the wind, think about standing up. Want to see Rene in action performing a stand up exit? Click in the video below! Skydive Spain is located in Southern Spain, 20 minutes from the beatiful city of Seville. We take you to 15,000 feet every single load from one of our Dornier G92 aircraft. 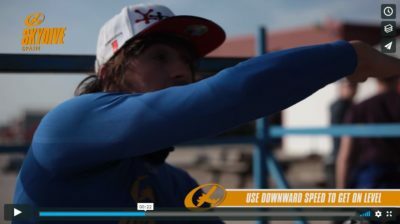 High level freeflying, FS, Wingsuit, team training. Perfect dropzone for any time of the year and forany level of jumper, whether you’re just starting your tandem or AFF courses, or have been legendary since day one, Skydive Spain is your dropzone. We go big and we go hard at Skydive Spain. Open all year with stunning weather, two large hangars, and all the altitude you need for some serious skydiving fun. Christmas boogies, Freefly events, FS events, one on one coaching and we offer training for BPA and USPA skydiving licenses. Come to Skydive Spain, jump in the sun, be epic.